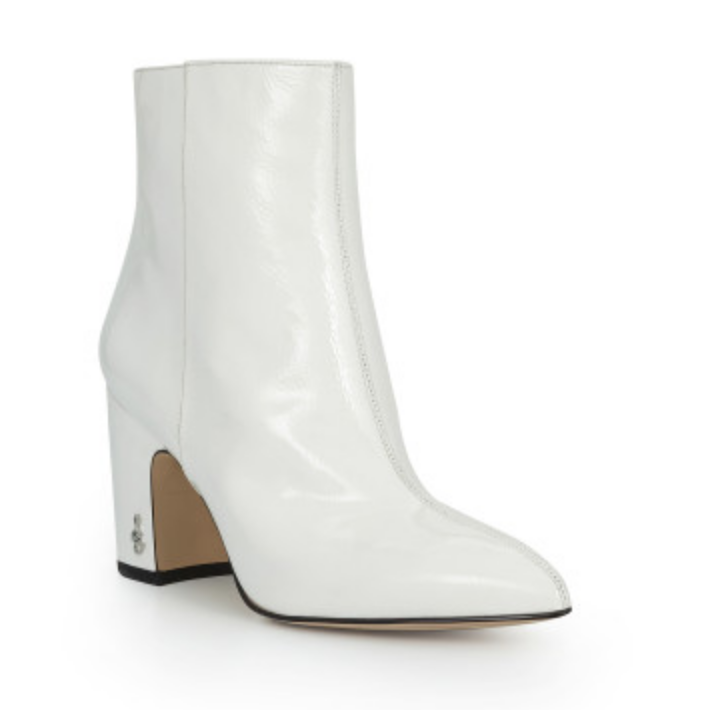 The white silhouette has been around since last fall, when it was labeled the “it” bootie of the season. We’ve seen everything from the kitten heel and cowboy boots to wedges and even Dr. Martens; it seems everywhere you look, a white bootie is stomping by. I think the reason it has such lasting power is because white is a neutral, like black, so it works really well with so many colour palettes. However, unlike the black bootie (which is a wardrobe staple) the white bootie screams fashion forward. I’ve been wearing white booties for a while and have gotten really comfortable styling them into every outfit. I looking forward to the pop it adds to a simple denim look. When I first got my Isabel Marant Leider boot, I had a thousand ideas running through my head on how to work them into every ensemble. My immediate go-to is always a light denim look (I find white boots work best with light jeans), but between season, we need transitional looks the white bootie is the perfect in-between bootie to finish off every outfit. I actually rocked this look in New York during Fashion Week and although I created the look in anticipation of spring, it really worked for winter as well. By adding a layer of fur (thanks Lysa Lash! ), I immediately winterized the outfit. I also love mixing prints; I find as long as the overall tone and colour matches, the patterns will mingle well together. I paired a boxed turtleneck and maxi pleated skirt with my stand-out bootie to tie everything together. Bare legs work effortlessly well with white booties, so shorts or skirts are an easy match. But, a much overlooked way to team the white bootie up is in an athleisure look. Mixing prints is mere child’s play compared to crossing over between styles. Don’t underestimate the power of a great track pant; in this case, the Y3 collab with Adidas was a serious winner and a no brainer for pairing the white bootie up to balance the look. Fashion Week really inspired me again for this look, and although it would’ve been way more comfortable to opt for sneakers with this outfit, I chose to skip them this time and throw on my good ol’ trusty white booties. When it comes to the white bootie trend, there isn’t really a wrong way to go, but there are a few tricks to keep in mind: balancing the outfit is important – you don’t want to get too dark all the way through, if you choose to go for a monochromatic suit look, then try to bring in a light element somewhere else with either a scarf or a clutch (thanks Zadig & Voltaire!). White booties are more versatile than you think. Although some may have thought they would be a passing trend, they have integrated into our wardrobes seamlessly. They add a minimalistic element to what might otherwise seem as an ordinary outfit. I also like to think that it’s not just the white bootie that has kept my black booties at the back of my closet, I’ve also had my metallic boots on rotation this year. Fashion this year is really showing us how if there ever were any rules, then it’s time we break them. The white boot is the perfect place to start. 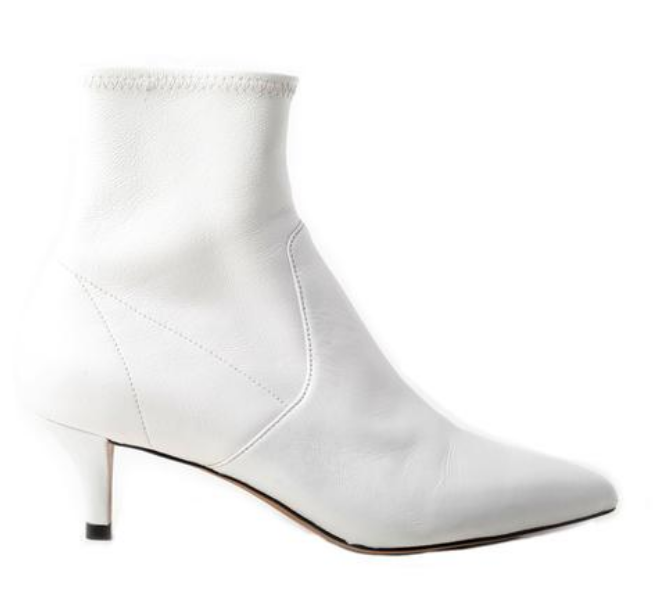 Quick note about my Isabel Marant Leider booties: the western-inspired ankle boot is an edgy twist to the straight up white bootie. Perfect for summer’s cropped jean or floral dress look, but they work so well for winter and spring as well. For professionals who want to spice up their work look or fashion lovers who want to put a new touch on their signature style, try the white bootie, you won’t be sorry.